Faculty of Pharmaceutical Sciences, UCSI University, No.1, Jalan Menara Gading, UCSI Heights, 56000 Cheras, Kuala Lumpur, MALAYSIA. School of Science, Monash University Malaysia, Jalan Lagoon Selatan, Bandar Sunway, 47500 Subang Jaya, Selangor, MALAYSIA. Garcinia genus plants are a group of well-known fruit trees in Malaysia.The botanical parts of the trees are used for medicinal purposes, where they are prepared as decoction, pastes for wound infections, and some have been consumed as food. Objectives: This paper focused on the assessment of antioxidant potential of three selected Garcinia species commonly used in Malaysia. Fresh plant materials were extracted using maceration, and various antioxidant activities of the extracts were evaluated. In vitro antioxidant properties studied were total phenolic and anthocyanin content, free radical scavenging (FRS), ferric reducing power (FRP) and ferrous ion chelating (FIC) activities. G. mangostana leaves and pericarps were found to consist of the highest TPC, FRS and FRP activities, followed by G. hombroniana and G. atroviridis. TAC was found only in G. mangostana pericarps. For fruit pulps, G. hombroniana exhibited the highest antioxidant activities (TPC, FRS and FRP), while G. mangostana had the lowest activities. FIC activity of the Garcinia samples behaved in dose-dependent manner and not correlated with TPC and other antioxidant activities. 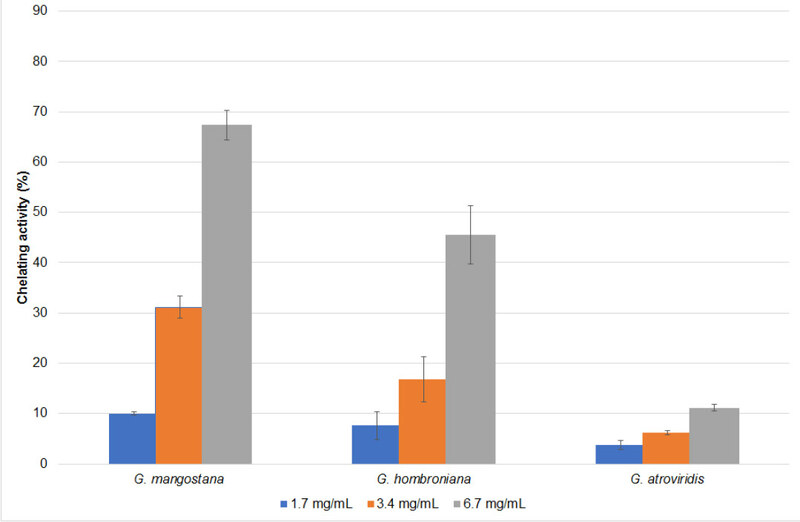 In general, G. mangostana and G. hombroniana leaves and pericarps exhibited good antioxidant activities, but the antioxidant activities in their fruit pulps were relatively low. G. atroviridis leaves and pericarps generally have lower antioxidant activities than the other species. Garcinia species have been used widely in Asia countries, especially countries in Southeast Asia. The investigation of various antioxidant activities could potentially identify the suitable candidates as sustainable source of antioxidative agents. These three Garcinia species are commonly consumed by Malaysian community as food, seasonings and used as traditional medicines. In view of the potential benefits listed above, it is therefore of great interest to evaluate the antioxidant activities of leaves, pericarps and fruit pulps and perform the statistical comparison. Fresh leaves of G. mangostana were collected from a farm at Semenyih. The leaves of G. atroviridis were collected from Rimbun Dahan Arts Centre at Kuang, Selangor. The plant materials were gifted by the owner, Mrs. Angela Hijjas. The leaves and fruits of G. hombroniana were collected from Kepong, Kuala Lumpur, Malaysia. The fruits of G. mangostana were purchased from a night market in Kuala Lumpur. The fruits of G. atroviridis were purchased from a farmers’ market in Seri Gombak, Selangor. All samples were collected or purchased on the day when the extraction was performed to preserve freshness and ensure the reliability of results. The plant materials were first washed and dried with clean tissue paper. Fruit pulp extracts were prepared as described in Lim, Lim9 while pericarp and leaf extracts were prepared as described in Chew, Goh10 In brief, 30.0 g of the fruit pulps were weighed and ground manually using mortar and pestle, followed by extraction using 100 mL 50% v/v ethanol with continuous shaking in room temperature for 60 min. For pericarps and leaves, 1 g of each sample were frozen with liquid nitrogen and ground into fine powder in a mortar. The powdered materials were extracted with 50 mL 75% v/v methanol, which was determined as the best solvent, with continuous shaking in room temperature for 60 min. The extracts were then filtered under vacuum and stored at -20˚C until further analysis was performed. The total phenolic content (TPC) of extracts was measured quantitatively using Folin–Ciocalteu method as described previously.10-11 Briefly, Folin–Ciocalteu’s phenol reagent (1.5 mL, 10% v/v) and 1.2 mL of 7.5% w/v sodium carbonate were added to the 0.3 mL extract. The reaction mixture was thoroughly mixed and was then incubated in the dark for 30 min, followed by measurement of the absorbance at 765 nm. TPC was expressed in terms of mg gallic acid equivalents (GAE) per 100 g sample. The total anthocyanins (TAC) were determined by the pH differential method.10 One mL of 0.2 M potassium chloride solution (pH 1.0) and 1.0 mL 1 M sodium acetate buffer (pH 4.5) were added into 2.0 mL of extracts respectively. The absorbance was then measured at 520 and 700 nm. The results are expressed as the amount of cyanidin-3-glucoside (cy-3-glu) equivalents per 100 g of sample (mg cy-3-glu/100 g sample), which are calculated as A/εL × MW × 103 × Dilution factor,4 where A is the difference of absorbance between pH 1.0 and 4.5; ε is molar extinction coefficient for cy-3-glu (26,900); L is the path length of the spectrophotometer cell (1.0 cm), and MW is molecular weight of cy-3-glu (449.2 g/mol). Free radical scavenging (FRS) activity was assessed based on the method previously described.11 Two mL of 0.15 mM 2, 2-diphenyl-1-picrylhydrazyl (DPPH) (in methanol) was added to the 1.0 mL serially diluted extracts. The reaction mixture was incubated for 30 min after which its absorbance was measured at 517 nm. Methanol was used as blank. Negative control was prepared by replacing the extract with methanol. The decrease in absorbance was calculated as an IC50, concentration of extract required to reduce the absorbance by 50% and the results were expressed as mg ascorbic acid (AA) equivalents per 100 g sample (AAE) as follow. The ferric reducing power (FRP) was evaluated as previously described.11 Potassium phosphate buffer (2.5 mL, 0.1 M, pH 6.6) and 1% w/v potassium ferricyanide (2.5 mL) were mixed with 1.0 mL of extracts of varying dilutions. The reaction mixture was incubated at 50˚C for 20 min, followed by the addition of 2.5 mL of 10% w/v trichloroacetic acid. Water (2.5 mL) and 0.1% w/v ferric chloride (0.5 mL) were then added to 2.5 mL of the reaction mixture, and the solution was incubated at 28˚C for 30 min to facilitate colour development. The absorbance was measured at 700 nm and the results were expressed as amount of gallic acid equivalents in mg per gram sample (mg GAE/g). Chelating activity (%) = (Acontrol – Asample)/Acontrol × 100; where Acontrol and Asample are the absorbance of the control and extract, respectively. Extraction solvent was used to replace the extract in control. All assays were carried out in triplicates. The experimental results were expressed as mean ± standard deviation. The data were analyzed using one-way analysis of variance (ANOVA) using SPSS version 20. Antioxidant properties of leaves, pericarps and pulps of the three Garcinia species were evaluated by determination of TPC, TAC, FRS, FRP and FIC. It was noticed that G. mangostana leaves and pericarps had the highest TPC (4360 ± 230 mg GAE and 10600 ± 984 mg GAE/100 g, respectively), followed by G. hombroniana (2910 ± 361 mg GAE/100 g and 1840 ± 256 mg GAE/100 g, respectively), and G. atroviridis (273 ± 44 mg GAE/100 g and 33.3 ± 4.7 mg GAE/100 g). On the other hand, G. hombroniana pulps possessed the highest TPC (152 ± 4 mg GAE/100 g), followed by G. atroviridis and G. mangostana (Table 1). It is to be noted that FRS and FRP antioxidant activities of leaves, pericarps and pulps followed the similar pattern as TPC (Table 1). Total phenolic content (TPC), total anthocyanin content (TAC) and antioxidant activities of leaves, pericarps and pulps of G. mangostana, G. atroviridis and G. hombroniana. TAC was only present in G. mangostana pericarps, where 29.7 ± 2.9 mg cy-3-glu/100 g was found. FIC activity of the leaves, pericarps and pulps were examined using three increasing concentrations. It was noticed that the FIC activity of the Garcinia samples behaved in dose-dependent manner. FIC activity of the leaves could be ranked as follows: G. hombroniana > G. mangostana > G. atroviridis (Figure 1). Statistical significance was noticed in the chelating activity of the Garcinia leaf samples. Garcinia pericarp samples exhibited similar chelating activity at lower concentration (1.7 mg/mL). 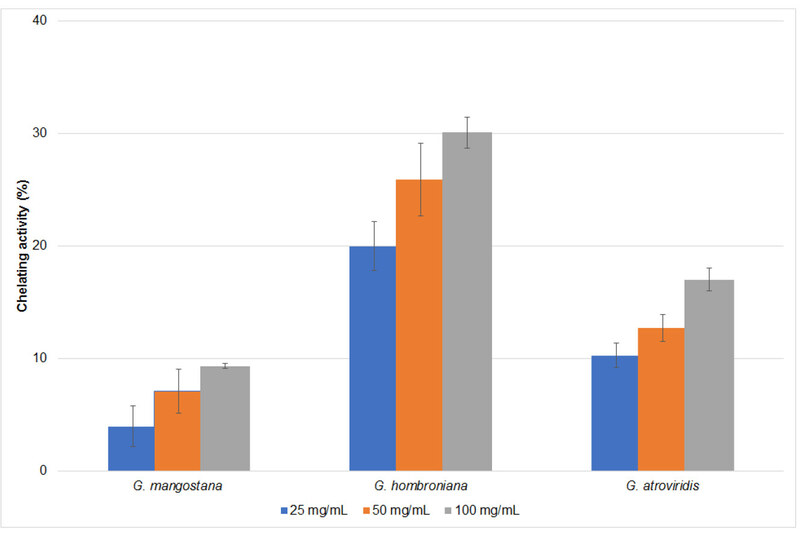 However, G. mangostana pericarps exhibited significantly higher activity than G. hombroniana and G. atroviridis at higher concentrations (Figure 2). G. hombroniana pulps exhibited the highest chelating activity (30% at the highest concentration), followed by G. atroviridis and G. mangostana (Figure 3). Ferrous ion chelating activity of G. mangostana, G. atroviridis and G. hombroniana leaves. Ferrous ion chelating activity of G. mangostana, G. atroviridis and G. hombroniana pericarps. Ferrous ion chelating activity of G. mangostana, G. atroviridis and G. hombroniana pulps. Recent study reported that G. mangostana pericarp extract (GME) could prevent the development of hypertension and cardiovascular using animal model.28 They reported that GME could reduce the vascular superoxide production and plasma malondialdehyde in hypertensive induced rats and lower the systolic blood pressure of induced rat without exhibiting hypotensive effect on normal control rats. Furthermore, the treatment of GME in induced rats also showed significantly lower mean arterial pressure, diastolic blood pressure, pulse pressure, and heart rate. Anthocyanins were only detected in G. mangostana pericarp. Three anthocyanins have been reported, namely chrysanthemin, cyanidin-3-sophoroside, and cyanidin-3-glucoside.15 Cyanidin-3-sophoroside gives the purple-brown colour of the pericarps. In conclusion, our findings showed that Garcinia species, especially leaves and pericarps of G. mangostana and G. hombroniana have very great potential to be developed into nutraceutical products since they are very high in antioxidant activities. This study has identified new sustainable source of antioxidative agents. 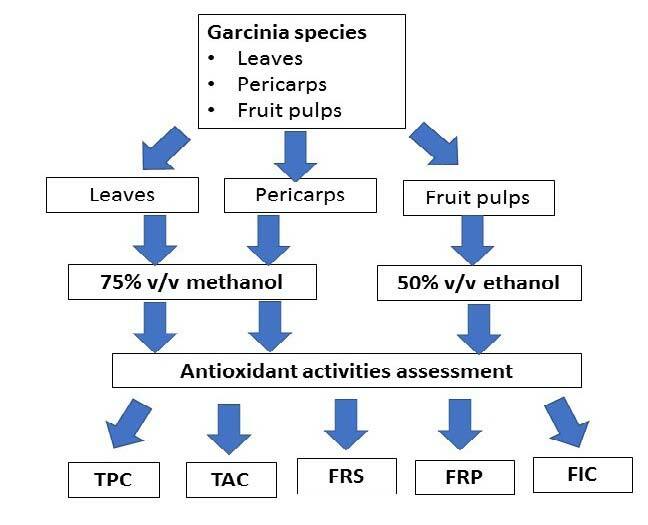 The extracts of Garcinia samples could be partially purified, and the fractions should be explored further to discover their potential to be used as alternative treatments for diseases which were related to oxidative stress. The authors are thankful to Monash University Sunway Campus for financial support. The authors wish to thank Mrs. Angela Hijjas from Rimbun Dahan Arts Centre at Kuang, Selangor for supplying the Garcinia samples. G. mangostana, G. hombroniana and G. atroviridis leaves, pericarps and pulps were evaluated for antioxidant activities, namely TPC, TAC, FRS, FRP and FIC. 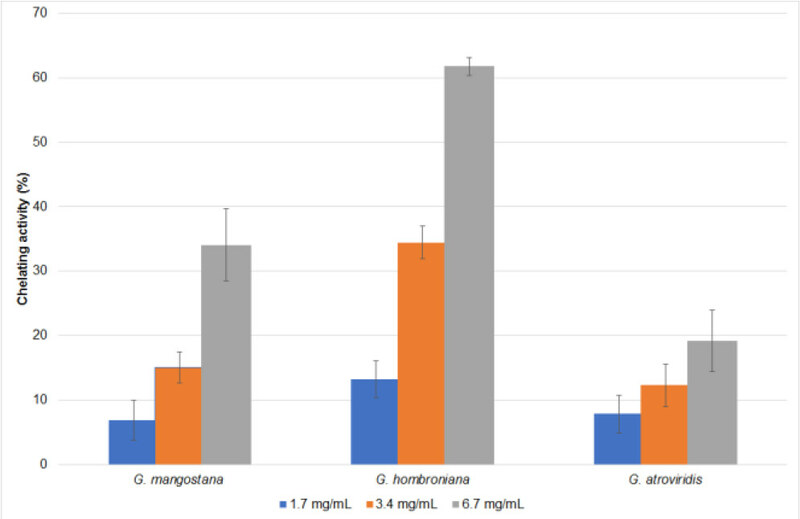 Leaves and pericarps of G. mangostana and G. hombroniana exhibited good antioxidant activities, but the antioxidant activities in their fruit pulps were relatively low. G. atroviridis leaves and pericarps generally have lower antioxidant activities than the other species. leaves and pericarps of G. mangostana and G. hombroniana have very great potential to be developed into new sustainable source of antioxidative agents. 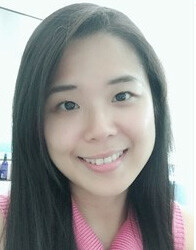 Dr Yik Ling Chew obtained her PhD from Monash University, Australia in 2011. Currently she is an Assistant Professor in Faculty of Pharmaceutical Sciences, UCSI University Kuala Lumpur, Malaysia. Her research specialisations include natural products chemistry and, various biological activities of tropical plants, including anticancer, antimicrobial, antioxidants. She has published research and review articles in renowned journals and presented her work in both national and international conferences. Dr Yau Yan Lim is an Associate Professor in School of Science, Monash University Malaysia, teaching Inorganic, Chemistry, Medicinal chemistry and Analytical Chemistry/Spectroscopy at all year levels. He leads a successful research team consisting of several postgraduate and undergraduate students. 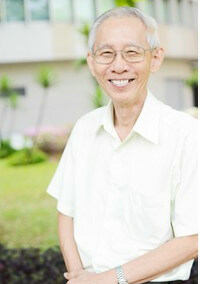 He is an elected Fellow of the Malaysian Academy of Sciences based on his significant contributions to chemical research and chemistry education. Copyright statement: Copyright: © Phcog.Net. This is an open-access article distributed under the terms of the Creative Commons Attribution 4.0 International license. Cite this article: Chew Y, Lim Y. Evaluation and Comparison of Antioxidant Activity of Leaves, Pericarps and Pulps of Three Garcinia Species in Malaysia. Free Radicals and Antioxidants. 2018;8(2):130-4. Antioxidant Capacity of Some Selected Medicinal Plants in East Nusa Tenggara, Indonesia: The Potential of <italic>Sterculia quadrifida</italic> R.Br.